The rat-a-tat of a woodpecker working over a dead tree may be an annoyance or it may be music to your ears, depending on what insects infest the old wood. Termites, insects of the order Isoptera, feeding on organic materials like vegetation and trees. They eat living and dead cellulose, including wood-framed houses. Woodpeckers are among many avian predators of nearly all of the 2,300 species of termites. Chickens (Gallus domesticus) enjoy eating insects. If you allow them to roam the yard, they'll scratch and peck at the soil all day while searching for a variety of bugs, including termites. Turn over an old, termite-infested log and your chickens will gobble down every termite in sight. Domesticated guinea fowl (Numida meleagris) also eat termites but are less likely to scratch up the seedlings in your garden while searching for edible insects. The classic image of woodpeckers pounding away at trees is more than a cliche; the birds are busily searching for a variety of pests, including ants, beetle larvae and termites. All the members of the Picidae family, including woodpeckers, sapsuckers and flickers, eat termites. 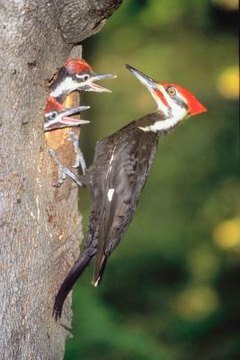 Only 22 woodpecker species live in North America, including the pileated woodpecker (Dryocopus pileatus) and red-headed woodpecker (Melanerpes erythrocephalus). Although protected in the United States, several woodpecker species are listed as critically endangered. Among the tropical bird species that feed on termites is the toco toucan (Ramphastos toco), native to South America. The toco toucan is the only non-forest-dwelling toucan. He lives mostly on figs and fruits, supplementing his diet with insects such as termites and the eggs and chicks of small birds. The South American yellow-rumped cacique (Cacicus cela) supplements his diet with winged termites, feeding on them as they swarm during the rainy season. In the spring, young winged termites emerge from the main nests, flying in large swarms as they seek mates and new homes. A number of waterbirds, including the African marabou stork (Leptoptilos crumeniferus), Egyptian goose (Alopochen aegyptiacus) and North American black phoebe (Sayornis nigricans) feed on the swarming termites. While marabou storks are scavengers that eat everything from carrion to termites, Egyptian geese thrive on a variety of plants and insects, and black phoebes eat primarily insects including termites and other arthropods. Birds eat a variety of seeds, fruits and insects, depending on their habitats, the season and availability of food. Termites are among the insects enjoyed by many species of birds as they forage through trees, vegetation and leaf litter. A few of the North American species include the American robin (Turdus migratorius), brewer's blackbird (Euphagus cyanocephalus), common yellowthroat (Geothlypis trichas), golden-crowned sparrow (Zonotrichia atricapilla) and western bluebird (Sialia mexicana). Nearly all birds that eat insects will grab and gobble a termite, however, hummingbirds generally avoid the winged termites, preferring insects with soft exoskeletons.